I love barbatti/ chinese long beans. 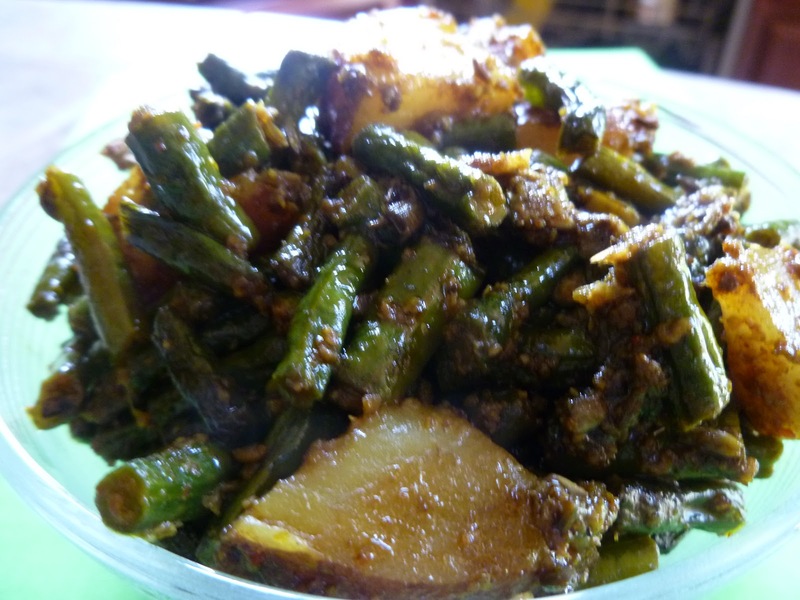 It is a very common vegetable in kerala cooking . It is called ACHINGYA PAYAR . My cooks barbatti in combination with potato and raw banana . She calls the stir fry ollath . This combo of barbatti and aloo with fennel seed is my aunt - in -laws recipe .She said she learned it from her friend. When i tried the barbatti ki sabzi at their place during this India visit and loved it requested her to give me the recipe. Next day i tried this recipe at her place under her guidance and noted it down :). Wash and cut long beans / barbatti into 11/2 inch long beans . Wash potato and slice into four half and slice into 1/8 inch pieces. Heat oil and add fennel seeds and after 30 secs add onion. When onion turns translucent add ginger garlic paste. Cook for another 30 secs on low heat . Add coriander , chili , turmeric powder and mix well. Bring heat to medium and add barbatti , potato salt . and add water . Mix well and cook for a few minutes and add water. Cover and cook the vegetable till barbatti is tender. Uncover and let the water dry out fully. When ready serve with roti. Barbati subzi looks great. excellent preparation. Simple but superb presentation, soon I will prepare aloo barbati according to you. Flavourful subzi,excellent pair for rotis.